Fifty miles south of Seattle, far from the traffic, the noise, and the 30-hour work days of Amazon employees, there is a 3,000 acre wetland waiting to be explored. 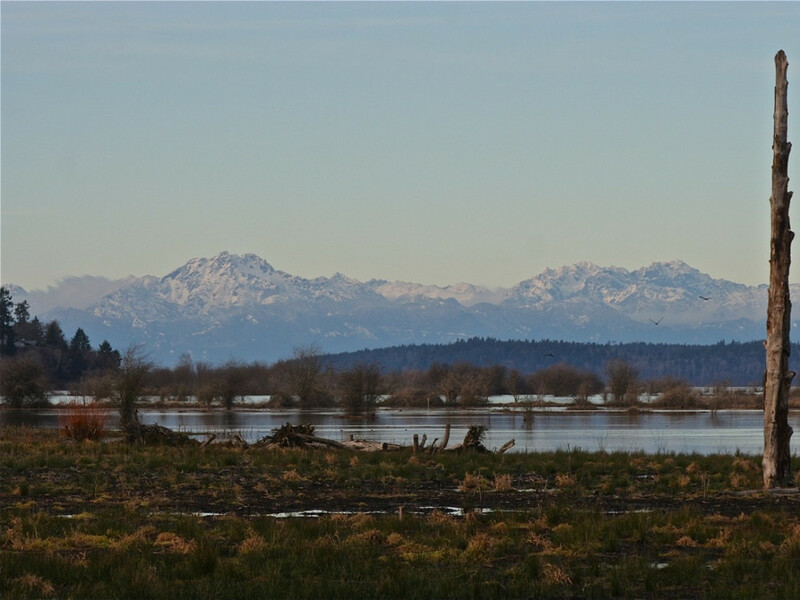 Just north of Lacey and south of Tacoma, the Nisqually Wildlife Refuge sits along the mouth of the Nisqually River. More correctly, the refuge sits in the Nisqually Delta, where the melting waters of the Nisqually Glacier on Mount Rainier meet the Puget Sound. The river, over millennia, has carved deep channels into the muddy sediment, creating a valley of wetlands between the Olympic and Cascade mountain ranges. Less than a half a mile from the traffic of Interstate 5, Nisqually Wildlife Refuge is indeed just that: a refuge from the daily grind. Located on land that was once the location of a Hudson’s Bay Company fort built in 1833, Nisqually Wildlife Refuge now is one of the premier birding destinations in the Puget Sound. Nisqually Wildlife Refuge is over four and a half square miles of a unique combination of estuaries, tidal flats, and fresh water marshes. Converging at the southern end of the Puget Sound, the refuge is surrounded by stunning views near the end of the Nisqually drainage. Here, where the salt and fresh waters meet, a hotbed of animal activity occurs year round. While deer, seals, and the occasional fox can be seen, the majority of the wildlife is of the avian variety, attracting birders from around the world. Birding has a negative connotation, usually most associated with binocular-clad elderly individuals, carrying clipboards and obsessing over rare finds. Nisqually Wildlife Refuge has those people, but it is much more friendly than one might imagine. 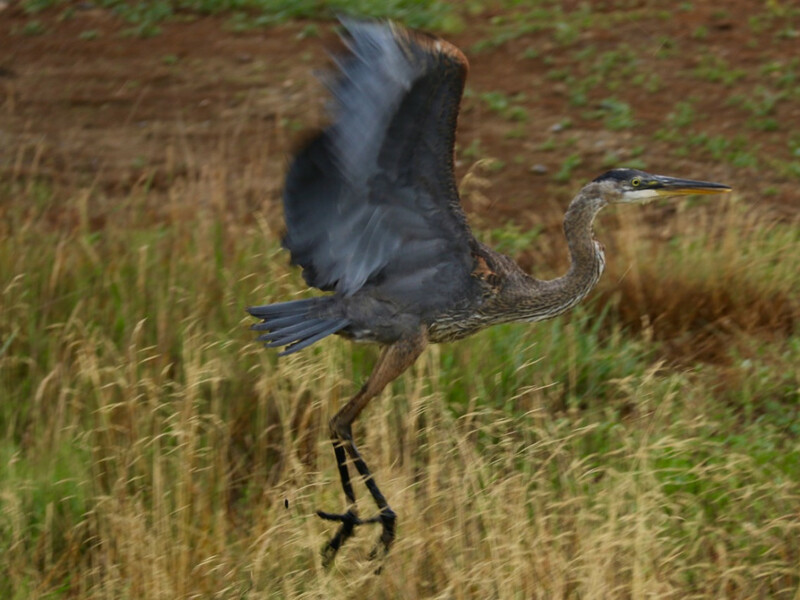 At Nisqually, birders of all levels enjoy the refuge, creating an atmosphere of education, discovery, and acceptance. Every Wednesday morning at 8:00am, birding experts and wildlife official survey the entire refuge for their weekly bird counts. This is a fantastic way to see what is at Nisqually, as well as learn how to identify the numerous species that frequent the region. Nisqually serves as a seasonal rest area for 275 migratory species of birds, offering year-round viewings of some of the best diversity of bird species in the Pacific Northwest. During the fall, seals and eagles hunt for salmon as migratory birds start arriving, flying south for the winter. Nisqually is also a rearing and migration habitat for various salmon species, as well as steelhead trout. The refuge offers over four miles of hiking trails with numerous viewpoints and experiences. To best understand how to explore Nisqually Wildlife Refuge, it is best to break it up into three sections, since different views and animals can be found in each area. Starting at the parking area, the best way to explore Nisqually Wildlife Refuge is to start at the Norm Dicks Visitor Center , named after a longtime Congressman who fought for the wilderness of Washington State. As you walk to the visitor center, please pay your three dollar entry fee and grab a map. The staff at the visitor center can provide updates on where the birds are and how best to see them. After getting all the information you desire, head along the boardwalk next to the ponds. In the ponds, ducks and turtles can be seen while eagles and hawks sit in the trees above. As you work your way into the taller trees, keep an eye at the trunks of the trees for resident owls, especially in the spring months. The path along the ponds will eventually lead, if you continue heading straight, to the Nisqually River Overlook. From here, it is common to watch dozens of eagles in the large trees downriver while seals and salmon swim in the river during the fall months. Nutria, raccoons, and the rare river otter can also be spotted from here, and those lucky enough may even see an incredible rare sighting of a sea lion chasing down a meal. 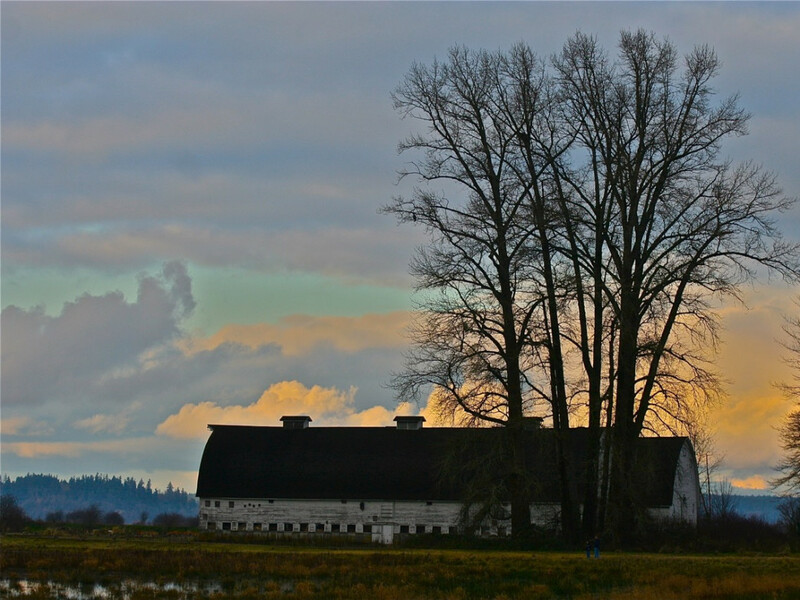 From the Nisqually River Outlook, the main path leads past two large barns, which occasionally give, to those looking up, views of owls and peregrine falcons. The path now turns into an old road that runs along the top of a dike, offering views of ponds to the left, and tidal flats to the right. 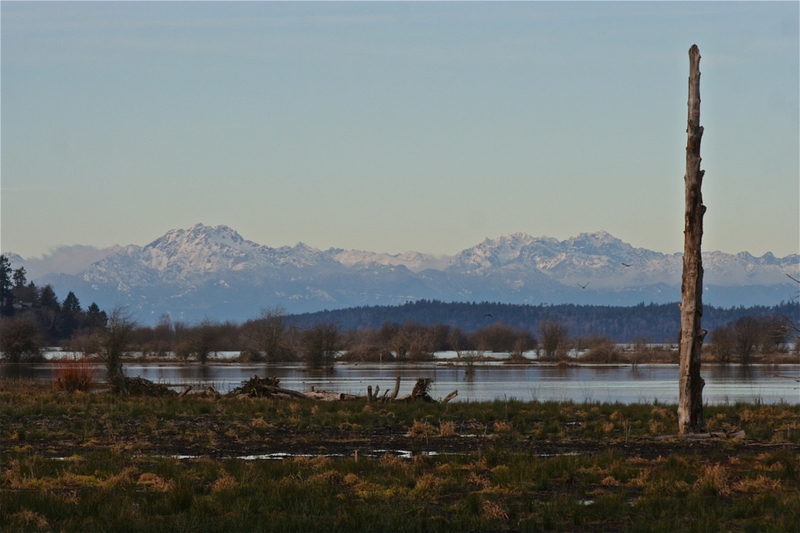 Hawks, blue herons, bald eagles, and numerous migratory birds flank each side of the old road, and off in the distance toward Puget Sound, the Olympic Mountains stand tall, showing off their rugged peaks. Overhead, ducks and geese fly, dodging the unwelcome advances of raptors soaring high above. During high tide, the area toward Puget Sound is covered in water, with rare seal sightings occurring. This is also an amazing spot to see the tidelands reclaiming old farmland, bring more life and energy to a once stagnant region. The highlight of wildlife viewing in Nisqually has to be the boardwalk that extends a mile long, spanning from the delta to the start of Puget Sound proper. For 5,280 feet, the elevated board walk gives birders and nature lovers a chance to walk above water, witnessing the estuary in a completely unique way. During high tide, the mud flats transform from their rich, red color into a vibrant ecosystem, where seals swim under, chasing fish next to posing blue herons. Eagles are commonly seen along the way, flying overhead causing flocks of shorebirds to band together, imitating the murmuration of starlings. As you follow the boardwalk, views of the Olympic Mountains vanish behind the hills of the Kitsap Peninsula. Don’t get discouraged though, because behind you, back toward the barns, Mount Rainier peaks over the foothills, appearing ever taller as you head to the gazebo at the end of the boardwalk. 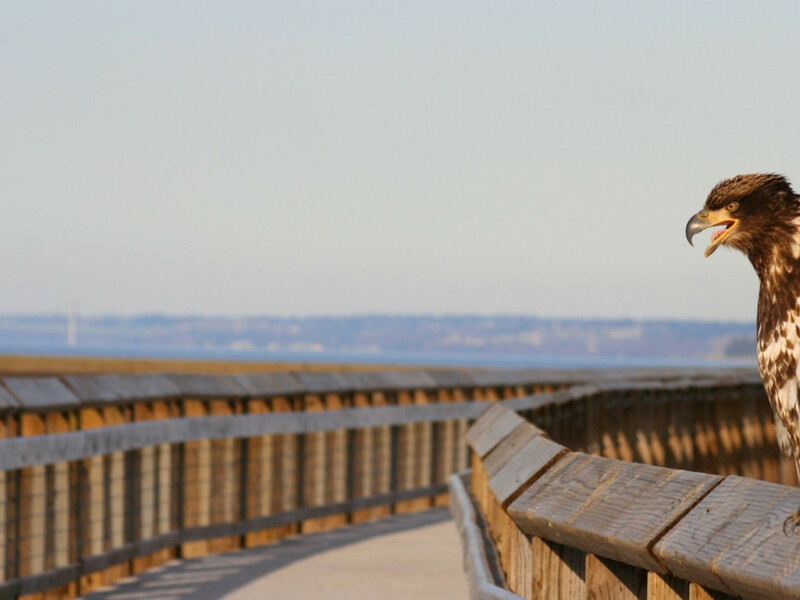 From the Puget Sound Viewing Platform at the end of the trail, the Tacoma Narrows Bridge can be seen to the north, with eagles, blue herons, and migratory birds dancing along the horizon. It is here, at the end of the boardwalk that visitors truly see how amazing Nisqually Wildlife Refuge can be.